The production of a new generation infantry fighting vehicle (IFV) may be launched in India. Russia and India are considering co-development of a new generation infantry fighting vehicle (IFV) at an Indian enterprise, Albert Bakov, first vice president and co-owner of the Tractor Plants Concern, told TASS on Wednesday. "There are plans of joint production of a new combat vehicle implying development and manufacture at their plant of a Russo-Indian infantry fighting vehicle. This is quite realistic, but no final decision on this has been made so far," Bakov said. "Our countries already have experience of joint work, for instance, the fifth generation fighter project," Bakov added. He said that there are a few more options of cooperating with India. "The Indians would like to launch the production of some vehicles in their country. At issue is the modernization of equipment in service with their armed forces as well as acquisition of equipment we’ve modernized," Bakov said. 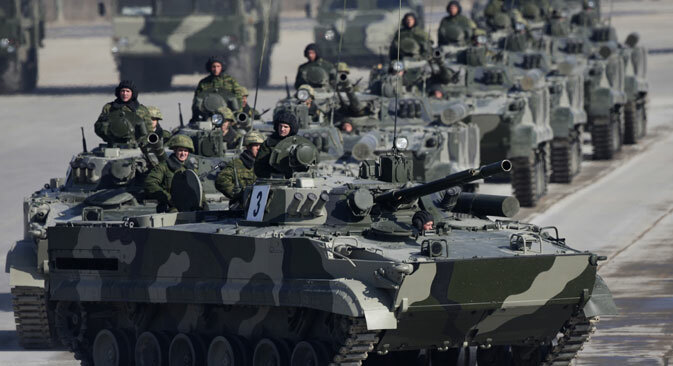 According to the company official, the Russian Defense Ministry may allocate extra funding for developing the new version of the BMP-3 Dragoon infantry fighting vehicle. "The Defense Ministry is interested in those vehicles," Bakov added. "Once we’re through with the trials, we’ll hold talks with them." He stressed that the Dragoon has no imported components. The newly developed version also differs from the baseline BMP-3 in that its powerplant is located in front and the landing compartment is fitted with a ramp. The Dragoon must receive a combat module armed with 2A70 100mm caliber gun, 2A72 automatic 30mm gun and PKT 7.62mm caliber machinegun. Bakov said the model demonstrated early in September at the Russia Arms Expo-2015 Defense Exhibition in Nizhny Tagil is not the Dragoon’s final version. What is now mounted on the turret, will be put away, as much as possible, in the body since all "the protruding parts" will become an easy target for enemy’s munitions," he said. "I think the process will take at least a year," Bakov added. He also said that NATO specialists "very carefully examined" the BMP-3’s new versions, Dragoon and Derivation, armed with the 57mm gun in Nizhny Tagil. "They did so, however, not because they wanted to buy them, as you well understand," Bakov added. Albert Bakov also told TASS that electric transmission for infantry fighting vehicles will be developed next year. "We wanted to show it at the exhibition [Russia Arms Expo - 2015] but had no time," the official said. "Everything is being done from scratch, through trial and error, which is why there are so many problems. But these problems can be solved. I think, we’ll build this engine next year," Bakov added. He previously reported about Tractor Plants’ plan to present the electric transmission prototype in 2015. Bakov explained that the fighting vehicles fitted with it will be less visible to thermal imagers. The electric transmission is going to be optimized in the BMP-3 body with a serious modernization of the vehicle.